Figure out the best color and design for your new kitchen backsplash can be daunting but the end result is always rewarding. You can make a boring or neutral kitchen pop with some new wall decorations that not only improve the look but help seal the wall and crevices in your kitchen from liquids. Another great thing about a new backsplash is that you can scale the price up or down depending on your budget and preferences. You may not get the same impressive look as a veneer tile but if you’re just installing some plastic backsplash in a rental unit then who cares? There are options for any kitchen style, whether you want a rustic look or more modern, we can help you explore some ideas. Porcelain or ceramic is a popular tile shaped material and can be cut and colored to be whatever you want it to be. There is a large selection of colors, textures and styles making it such a popular backsplash option. Glass backsplashes look clean and cool in the kitchen, adding a more modern urban look. The reflective properties of the glass will also help reflect light. 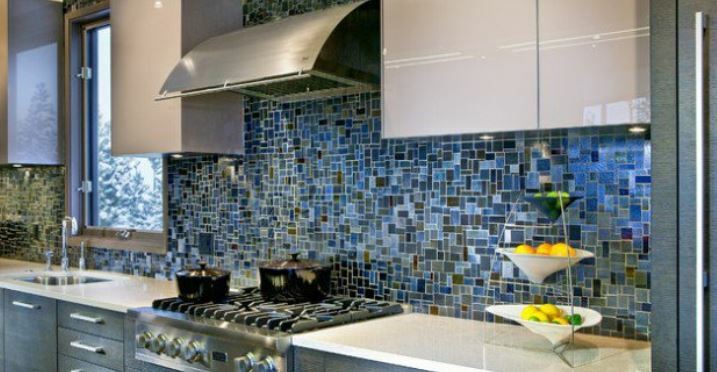 Metal tile finishes are also popular in commercial style kitchens or to match your appliances. Plastic backsplashes are one of the cheapest and easiest materials to install. You can literally cut some plastic backsplash materials with scissors. Contact Beckworth LLC for a free quote, we will be happy to come and go over the options you have for materials and designs to improve the look of your kitchen and brighten things up. Interior remodeling is our specialty so when it comes to kitchen designs we are not only experienced but passionate about what we do.